I am utterly susceptible to trying practically any game at all if enough people talk about how good something is, regardless of my own trusted experiences with said game. I simply cannot resist seeing for myself what the fuss is about. This flaw in my psyche is why I tried WoW three times, why I patched up LOTRO last weekend, and why I am now re-downloading Dungeons & Dragons Online Unlimited. Having tried the free trial of DDO (pre-Unlimited) on two separate occasions, I can say that my previous impression was that I vehemently hated it. I simply do not feel that a video game based on a pen-and-paper strategic turn-based combat system is the place to insert an real-time, action-based combat system. I agree with Syncaine in that I feel combat is far too fast, and that it is this fast in a game based on Dungeons & Dragons of all things is particularly upsetting to me. I also found it frustrating that outside of RPing in a tavern, I did not feel there were enough tools to make role-playing choices or interact with the environment in the sort of varied way you would get with the traditional PnP version. My cleric felt like just another cleric running just another dungeon (and don’t get me started on repeating dungeons! ), and while I accept that this is the case in many other MMOs, I expected so much more from such a franchise. There is also a rather vocal contingent on the forums who show up to any negative post or review of the game, eager to tell anyone who doesn’t love it all about how they’re obviously doing it wrong. In short, I had expected a more role-play heavy, slower combat type of game. I had been looking forward to seeing more room and more in-game rewards for personal creativity realized in digital form, and I was sorely disappointed with the reality. But I am me, and I cannot resist picking the game up again in light of the newest reports that members, subscriptions and profits are way up for DDOU these days. I admire Turbine for implementing a F2P model that has far eclipsed many others currently being tried in the western gaming world. In some way, I want to do my part to support them because I want other companies take heed and adopt this model as well. I don’t know that I will not throw my mouse at the monitor (…again) after half an hour of clickclickclicking my way through another dungeon. 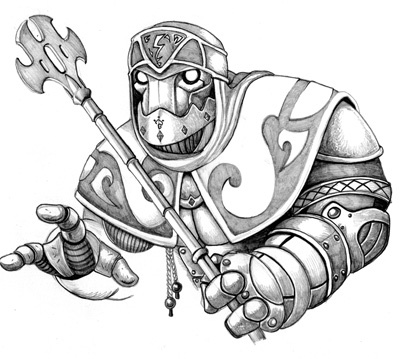 I do know that I will be purchasing a Warforged character this time around, for increased survivability (this is a huge hit to my Pretty, Pretty Princess factor, but so are the red-blooded character models). I will be taking advantage of the Hireling system, which is new to me, as well as playing with my better half and perhaps a couple of RL friends when possible. I want to like this game so badly. It is the only Dungeons & Dragons Online we have, and probably the only one we ever will. If I can just manage to have some fun this time, I am sure that I can overlook everything else. I am taking a deep breath, dusting DDO off, and going back in.